David Jarrett from the British Trust for Ornithology describes a collaborative project on breeding waders taking place in the east Cairngorms. Gamekeepers, rangers and volunteers in the east Cairngorms have been working with the British Trust for Ornithology and the East Cairngorms Moorland Partnership to investigate the challenges facing our breeding wader populations. Participants were trained to survey breeding waders and monitor their nests using trail cameras and data loggers. During the first year of the project, more than a hundred wader nests were monitored across the project area. 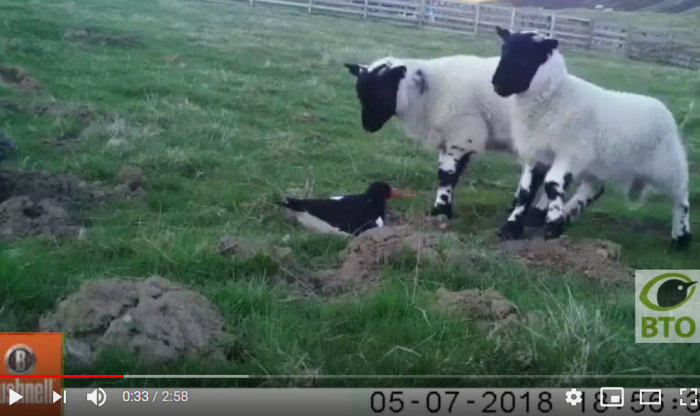 These nest videos show some of the more interesting footage, and illustrate some of the challenges faced by breeding waders. These Snipe chicks appear to have had a lucky escape! A variety of predators and passers-by at Lapwing nests. Breeding waders have declined across the UK due to predation and habitat loss caused by forestry and changes in farming. Upland areas with suitable open habitats where predators are controlled are increasingly important for breeding waders. Involving people on the ground in data collection presents a great opportunity to improve our knowledge on how breeding waders are faring in these landscapes. The project is likely to continue in future, and a report on the first year of the project is available here. Thanks to staff at Balmoral, Glenavon, Glenlivet, Invercauld, Mar, Mar Lodge and Rhiedorrach Estate, and the Tomintoul and Glenlivet Wildlife Group who carried out the fieldwork for this project.